Playing third base last season, Carlsbad’s Deshea Hill led the team in batting average (.485) and RBIs (41). 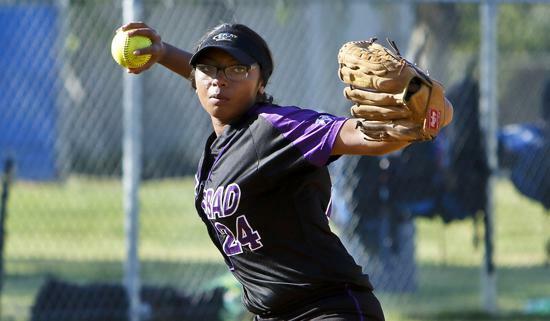 CARLSBAD  Deshea Hill made quite an impression during her first softball season at Carlsbad High in 2015. Considering Hill skipped her freshman year to concentrate on playing with her travel team, her productivity was remarkable. Yet despite leading the team in batting average (.485) and RBIs (41) and tying for the lead with four home runs, Hill missed her favorite position. The third baseman loves to pitch, but a nagging ankle sprain kept her out of the circle before she returned this year with a two-inning stint in the opener against West Hills. The results were less than thrilling after missing more than six months, but at least she was back doing what she loves. “I felt pretty comfortable back in the circle,” said Hill, who’s pitched about a half-dozen innings this spring. “I was a little nervous, but it felt fine pretty quickly. Hill began playing softball as a kindergartner in Oceanside, a year or two after sister Iesha started. Both play third base, and both provide their team with run production. While Deshea was slugging last year for the Lancers, Iesha, a 2014 graduate of Carlsbad, was doing the same at Palomar College with a .440 average, nine homers and 49 RBIs. “I used to watch her play all the time,” Deshea said. “I would either watch her play or be off playing catch during her games. For Deshea, softball has been the only sport that’s held her interest. She never seems to get enough of it. If it were up to her, she’d play a game and then go off to another field to immediately play another game. “I’m such a competitive person,” Hill said. “I have to play softball. That’s why I play travel ball, just to keep playing. As to which Hill sister is better, Deshea was quick to answer. “Iesha is a better fielder than me,” she said. “I’m a better hitter. Deshea, who already has three homers and 14 RBIs this year for the Lancers, loves those moments when she comes to the plate with runners in scoring position. “I try to treat it like it’s just another at-bat in the game,” she said. “It’s just me and the pitcher. I can’t hear the crowd or anyone else. “It’s a tough thing to learn and most players never learn it. Once I figured that out, it was a lot easier because there wasn’t as much pressure.